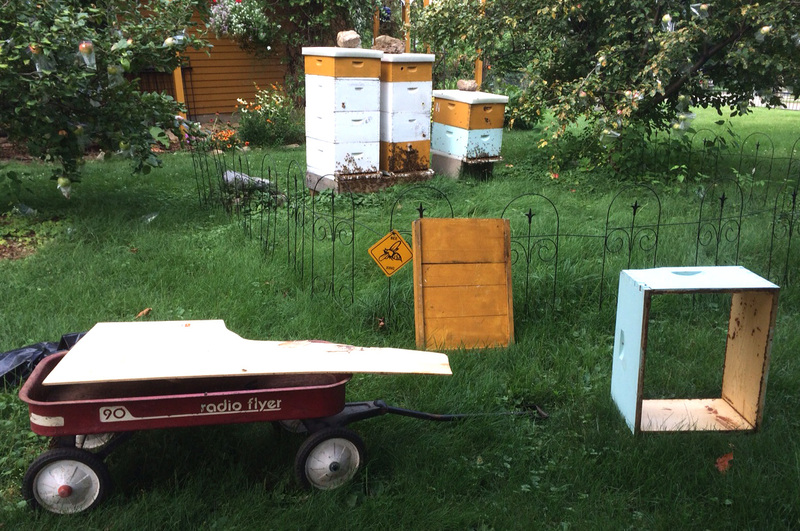 POLICE REPORT: Despite active efforts by busy teams of workers, three hives were looted of honey yesterday afternoon. This is a sad closing to a busy summer of honey making. Large, ungainly creatures dressed in white and wearing funny hats removed numerous combs of honey. One worker hid herself in a creature’s clothes and took revenge, but this did not halt the crime. Observers estimate that half of each hive’s honey may have been taken. Meanwhile, no statement has been issued by the queens or drones of the affected hives. PHOTO: The scene of the crime. The large, empty box bears silent testimony to the cold-blooded theft of many large combs. Note the red wagon used in the getaway. The looting began late Saturday afternoon. Workers tried valiantly to stay with their combs, but many were forced away with brushes and smoke. Two boxes of smaller combs were quickly wrapped in plastic after ejecting the workers. A third small box of combs retained numerous workers, but after exiting the comb they were unable to find their way back in. Attempts to keep control of a large box of combs resisted numerous attempts to eject the workers. The box was placed on a red wagon pulled around a nearby house. The box came to rest behind the house, apparently in hopes the bees would return to their hives. Instead, many workers kept their posts. Others flew countless sorties to link back up with the hives. As darkness fell, the defense of the big combs continued. The box was loaded into the back of a minivan and driven around the neighborhood. Numerous workers were lost. The box finally came to rest. A team of workers determined that the box was near the hive, and it had a hole to allow access. Honey recovery procedures were planned, but the falling dark made them impractical. Reinforcements reached the big combs from the hives Sunday morning, working the honey and flying patrol around the area. Honey recovery was stymied by Sunday morning schedules, and only a small amount of honey was recovered through the hole. After noon, the large white creatures brought smoke and brushes again, and removed all workers from the large combs. All of the looted honey was again loaded into the minivan and driven away. The honey combs, and the valiant workers who tried to protect them, were reported heading south. They have not been seen since.